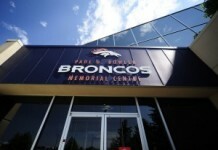 With the 2018 NFL draft fast approaching, the Denver Broncos are making certain that they leave no stone unturned in their research to ensure they take full advantage of the fifth overall pick. 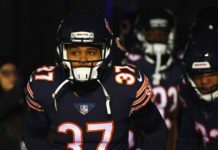 The Broncos have indicated that no player or position is off the table, so speculation has been running wild in Denver Will the Broncos take Saquon Barkley, the most explosive player in the draft? Will they draft pass-rusher Bradley Chubb to help reinforce one of the league’s most impressive defenses? Will they draft can’t-miss guard Quenton Nelson to bolster a fragile offensive line? Or will they select one of the many skilled quarterbacks available to set the team up for long-term success? Though these are all realistic possibilities, there are signs the Broncos could be headed towards drafting one of four quarterbacks (Sam Darnold, Baker Mayfield, Josh Rosen or Josh Allen) with the fifth pick in the NFL Draft. Each NFL team is allotted 30 pre-draft visits with players and the Broncos are using a few of these valuable visits on three of top quarterback prospects. UCLA’s Josh Rosen visited Dove Valley on Wednesday, and on Friday, Apr. 6th, the Broncos will be making a trip to southern California to hold a private workout with USC quarterback Sam Darnold. Wyoming quarterback will meet with the Broncos on Monday, Apr. 9, and Oklahoma’s Heisman Trophy-winning quarterback Baker Mayfield is expected to arrive at Dove Valley a week later on Apr. 16. 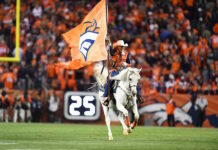 Denver recently signed former Minnesota quarterback Case Keenum to a hefty two-year contract, and while he will be an upgrade from last year’s quarterback trio, he may just be the short-term solution to help bridge the gap for a younger star to take over and lead the team for future years. While it is a near-impossibility that all four of these quarterbacks are available when it’s the Broncos turn to select, there is a chance that at least two of them will be. Each quarterback shows tremendous promise for different reasons, so determining which one would fit the Broncos best will be key. Darnold is leaving USC after just two seasons. He became the starter during his freshman season at USC and led the Trojans to a 21-6 record and a Rose Bowl win during his time there, throwing for 7,229 yards and 57 touchdowns. There are concerns about Darnold’s decision-making, but those are things a good coach fix; the right coach could set Darnold up for NFL success. During Darnold’s pro day, he didn’t disappoint, making beautiful and accurate throws all over the field, despite a constant, heavy rain. 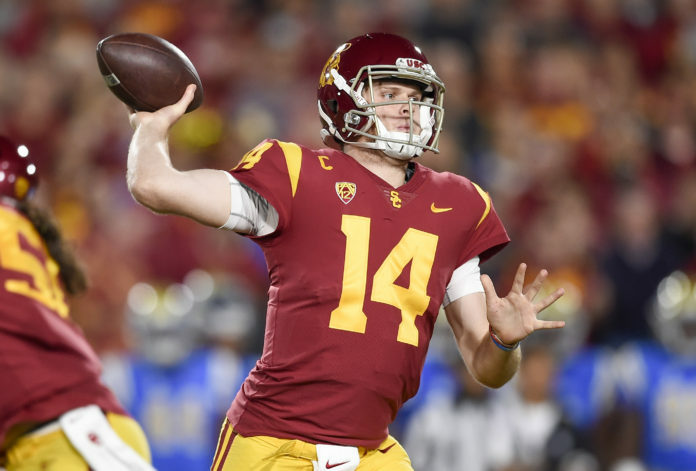 Darnold is the youngest of the four quarterbacks, but he showed poise while leading USC to a late fourth-quarter comeback win in the 2017 Rose Bowl. Darnold seems unlikely to reach No. 5, but if he did, the Broncos would be hard-pressed not to pounce. On a rainy ☔️ day in Southern California, Sam Darnold shined at @USC_Athletics' Pro Day! ?? The Oklahoma Sooner has one of the most unique stories in the draft. A walk-on at Texas Tech before walking on again at Oklahoma, Mayfield never looked back after claiming the starting quarterback job, leading the Sooners to a 34-6 record over three seasons while throwing for 12,292 yards and 119 touchdowns in his Sooner career. The defending Heisman Trophy winner, Mayfield is shorter (6’0″) than most NFL quarterbacks, but his passion and determination, combined with his excellent mobility and pinpoint accuracy is what makes him stand out. The Broncos could gamble on potential, and hopefully watch Mayfield develop into a Drew Brees or Russell Wilson-type player throughout his career. The UCLA quarterback may be the most confident player in the draft, and while it may rub people the wrong way, he’s the most NFL-ready quarterback available in this draft. Rosen was not surrounded by the talent Darnold or Mayfield had at their disposal, but was still able to shine in his three years at UCLA. In his freshman year, Rosen’s junior year was his best, as he threw for 3,756 yards and 26 touchdowns and finished with 9,340 yards and 59 touchdowns over his collegiate career. His win-loss record may not be as appealing as Darnold or Mayfield’s, but Rosen has had impressive seasons each year and has an arm that can fling the football nearly 70 yards — a feat that wowed scouts during his pro day. Depending on which scout you talk to, Allen might be a Hall of Fame player — or a complete bust. The 6’5″, 237-pounder out of Wyoming has the type of athleticism that teams drool over; he’s tall with a solid frame, mobile and ridiculously strong — Allen can easily throw the ball 70 yards in the air, opening up any offense. The concerns for Allen revolve around the subpar competition that he faced in the Mountain West, and his accuracy. Allen’s 56.3 completion percentage as a senior doesn’t impress, and he was less effective across the board compared to his junior season. History isn’t kind to quarterback prospects with poor accuracy in college; hence the boom-or-bust nature of his s scouting reports. But when you can throw the rock like Allen can, more than a few teams will happily take that gamble. It will be interesting to see where the Broncos stand after the next two weeks, but it’s not far-fetched to consider that one of these four promising athletes will be selected by Denver, and become the quarterback of the future for the Denver Broncos.